I’ve been reviewing quite a few of Basketball AR games on my blog, including AR Sports Basketball, AR-Basketball, Pumpkin Basketball and NBA AR App. NBA App was probably one of my favorite ones because the physics felt good and I really liked the visual effects in the game. However, I have to be honest, I am kind of fed up playing these types of casual hoop basketball arcade games. They were fun when I just got started playing AR games, but the fun didn’t last long. I’ve seen some other similar games but I have decided to focus on other AR games. Those games just don’t bring anything else to the table. Well, today I am going to review yet another hoop basketball game called AR Dunk. You might ask yourself if there is something wrong with me. Why after saying what I’ve said I’ve decided to review yet another game like that? Well, because the developer bothered with trying to deliver something different and I felt a need to credit him for that by writing and letting other gamers know about it. AR Dunk is not your casual AR Basketball game. It looks different and also feels different when you play it. First of all, let’s clarify one thing. AR dunk plays quite similar to other basketball hoop games with some differences that I’ll talk about in a moment. You have a backboard and you need to flick a ball so it lands inside the basket. However, the developer has made it looks and feel different, buy employing asci-fi futuristic theme. The basket board looks really amazing, like metal with cool electronic-board like texture, it’s poll-less and floats in mid-air using jetpacks with beautiful blue jet gas flame. I don’t know about you, but I think this jetpack basketboard looks cool. It even floats nicely in the air with nice floating animations. It even floats from side to side as you play, to make it harder for you to nail a shot. The basketboard can move without any notice. A nice mechanic which is the main reason why I failed most of the time. The controls are very simple. There is a blue dot in the middle of the screen, you need to aim it towards the hoop room and swipe up to release the ball. The longer the swipe, the stronger the throw. Another cool mechanic is that the backboard can move at any given time. I think the movement triggers after several seconds after you put the ball in the basket. It’s very tricky. I always lose because of it. Players can also achieve a bonus shot by making clean streak shots. The rim and the ball will start burning with gorgeous blue fire, and this is the time to quickly put the ball to get that extra bonus score. The game has very nice sci-fi inspired visual effects. I personally think that the developer should have added some nice visual effect when the ball gets into the basket, like in NBA AR app, it just feels a bit boring like that. 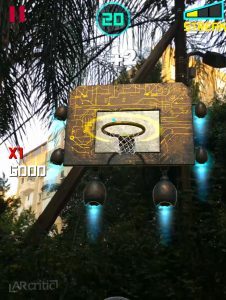 If you already invest in a nice futuristic look, why not add visual effects when the user puts the ball in the basket, which is actually the only thing you do in this game. Make it more visually satisfying and rewarding for the player. This is one of the ways to achieve this. Also, the +1 animation looks plain, it should be more “explosive” and vivid, not look like a standard white font. Same goes for the other UI elements. I think there is room for improvement. If I had to design the backboard, I would have included some nice electric current animation as well. Instead of a static image, make the yellow lines animated like there is something moving there. Having said all that, I need to compliment the developer for taking a different art direction and not going with the flow, making a boring standard backboard. This is creative thinking that I love seeing from developers. Instead of rushing to code, way a bit, think about different ways to design a game. As you can see, it’s a simple game, but these simple changes make a big impact. The physics work well, although the throw feels like a semi-automatic, I personally prefer a more precise control over the ball. There is also an option to obtain in-game currency which you can use to unlock cool skins for the basketball. AR Dunk doesn’t bring anything exciting in terms of the core gameplay mechanic, but the game felt different than all the other basketball AR game because of the unique theme and sci-fi feel of the game. The board’s movement made me feel like the board has a personality and it tries to trick me in purpose. I felt like it’s me versus the basket, so it felt more personal and therefore more engaging and fun. The game features high-quality graphics, smooth and vibrant animations and nice score and bonus score on-screen notifications. The global leaderboard is obviously needed for this type of game and was added. Once you play it you can see what I mean. It’s fun, challenging and feels somewhat different than your casual AR basketball game. I try to break up its features to let you understand why it feels different, so if you are a developer, you can get inspired by it. Having said all that, I do think that there is plenty of room to make it even more exciting with cool different backboards that have their own unique physics and movement patterns. more flashy visual effects, etc. However, this is what it is. This game was developed as a casual basketball game with a unique twist. It delivers are more exciting gameplay compared to all the other AR basketball games that I’ve previously played. The key word here is “Different” and it worked really well for this game. I still prefer the physics in NBA AR app though. AR Dunk is a free-to-play AR game. It’s not an ARKit game as it is compatible with iOS 7.0 or later. Still, I found it to work really well and didn’t find any notable AR issues. If you love ball throwing games, I recommend downloading this game. Download AR Dunk from the App Store here. AR Dunk takes the conventional AR basketball games and turned it into a futuristic sci-fi one with a floating backboard and beautiful visual effects. The formula works well, as this new art design and animations help deliver a somewhat different experience. I did enjoy playing it and even if you are fed up with Basketball AR games, I still recommend trying this game out.